Adibhesami, M., Ahmadi, M., Farshid, A., Sarrafzadeh-Rezaei, F., Dalir-Naghadeh, B. (2017). Effects of silver nanoparticles on Staphylococcus aureus contaminated open wounds healing in mice: An experimental study. Veterinary Research Forum, 8(1), 23-28. Masood Adibhesami; Malahat Ahmadi; Amir Abbas Farshid; Farshid Sarrafzadeh-Rezaei; Bahram Dalir-Naghadeh. "Effects of silver nanoparticles on Staphylococcus aureus contaminated open wounds healing in mice: An experimental study". Veterinary Research Forum, 8, 1, 2017, 23-28. Adibhesami, M., Ahmadi, M., Farshid, A., Sarrafzadeh-Rezaei, F., Dalir-Naghadeh, B. (2017). 'Effects of silver nanoparticles on Staphylococcus aureus contaminated open wounds healing in mice: An experimental study', Veterinary Research Forum, 8(1), pp. 23-28. Adibhesami, M., Ahmadi, M., Farshid, A., Sarrafzadeh-Rezaei, F., Dalir-Naghadeh, B. Effects of silver nanoparticles on Staphylococcus aureus contaminated open wounds healing in mice: An experimental study. 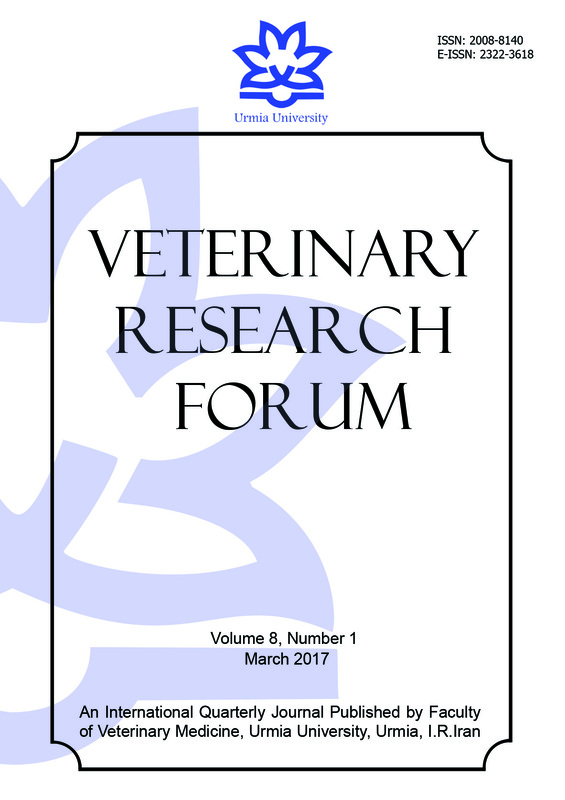 Veterinary Research Forum, 2017; 8(1): 23-28. The microorganisms have been noted as the main cause of delayed wound healing.The most common pathogen causing the wound infections is Staphylococcus aureus. Silver nanoparticles (AgNPs) show ample antibacterial activities. In the present study, the effect of AgNPs on mouse wounds inoculated with S. aureus was investigated. Sixty male mice (20 to 30 g) were anesthetized, full-thickness skin wounds were made on their back and then the bacterial suspension was added to each wound bed. Treatments were administered on wound bed topically including gentamicin (8 mg kg-1), AgNPs (0.08 mg kg-1, 0.04 mg kg-1 and 0.02 mg kg-1) and normal saline in the control group. Wound healing was monitored macroscopically by taking digital photographs on days 0, 7, 14 and 21 of the experiment. Topical application of gentamicin and AgNPs (0.08 and 0.04 mg kg-1) significantly increased the rate of wound healing more than treatment with AgNPs at a dose of 0.02 mg kg-1and normal saline. The presence of silver nanoparticles in AgNPs groups (especially 0.08 mg kg-1) improved wound appearance better than other groups without silver nanoparticles (gentamicin and control groups) and led to lesser wound scars. According to data analysis, healing rate of treated mice with gentamicin and AgNPs (0.08 mg kg-1) was significantly (p < 0.001) faster than treated mice with other AgNPs doses and normal saline. The results of current study introduced an in vivo nanosilver accelerating effects on the treatment of on S. aureus infected skin wounds. One of the main objectives in wound healing is restoration in the shortest time with minimal side effects.1 Today, infection is considered as a first cause of mortality owing to wounds, especially after surgery.2 Staphylococcus aureus has an important role in the infection after surgery from ancient times.3 In this regard, several antimicrobials agents were used, but each one had serious limitations or side effects such as delaying of wound healing and bacterial resistance to antibiotics.4 Therefore, less expensive methods with fewer side effects have to be applied. There is an increase in the medical application of nanoparticles in the process of wound healing.10 In the present study, we have investigated the effect of silver nanoparticles (AgNPs; 20 nm in diameter) on surgically induced full thickness skin wounds inoculated with S. aureus and superficial and deep bacterial load of wounds’ local infection in mice. All procedures in this study were carried out in accordance with the guidelines of the Animal Ethics Committee of Faculty of Veterinary Medicine, Urmia University (AECVU) and supervised by authority of Urmia University Research Council (UURC). where, A0 is the initial wound area and At is the area of wound at the time of image capturing and bacterial counting (on days 0, 7, 14 and 21, respectively). Areas were evaluated by the images of the wounds using image analysis software after calibration in same days. The animals were euthanized with CO2 inhalation. Statistical analysis. Statistical analyses of data were done using the SAS software (version 9.4; SAS Institute Inc., Cary, USA). Comparison of the effects of AgNPs, gentamicin and normal saline in different groups and time on wound area, diameter and contraction were done by mixed methods (proc mixed) and repeated expressions. Preliminary data assessment using the box plots was performed for the presence of outliers, homogeneity of variance and data distribution. To estimate assumptions, square root and/or natural log data were analyzed. Constant variables of model were included group, time and the interaction between them. Mice were random effects of model. The area and diameter in day 0 were used as the covariate data. Various covariance structures (first-order auto-regressive, heterogeneous first-order autoregressive, first-order ante-dependence, Toeplitz, unstructured, compound symmetry, and heterogeneous compound symmetry) for choosing a suitable model of solidarity and variance during time were evaluated according to the Akaike’s information criterion and the best structure selected on the basis of the lowest criteria mentioned. Survey of residuals against predicted values was used to assess the final model. Compare of groups’ pair was performed using Bonferoni test. The results of these variables are shown as a least-square means ± SEM least squares means. Among the animals, healing rate of treated mice with gentamicin (8 mg kg-1), AgNPs (0.08 mg kg-1) and AgNPs (0.04 mg kg-1) was significantly (p < 0.001) faster than mice treated with AgNPs (0.02 mg kg-1) and untreated ones from days 7 to 14, but no differences were observed between control group and AgNPs (0.02 mg kg-1) and between gentamicin (8 mg kg-1) and AgNPs (0.08 mg kg-1) in day 7. The results showed that there are significant differences (p < 0.001) between control group and AgNPs (0.08 mg kg-1), AgNPs (0.04 mg kg-1) and AgNPs (0.02 mg kg-1), and gentamicin (8 mg kg-1) and AgNPs (0.02 mg kg-1) in day 14. Finally, no difference was observed among all groups in day 21 (Fig. 1). Fig. 1. Effects of topical application of gentamicin(8 mg kg-1), AgNPs (0.08 mg kg-1), AgNPs (0.04 mg kg-1) and AgNPs (0.02 mg kg-1) on the healing of full-thickness wounds in mice. Representative images of mice from groups taken on 7, 14 and 21 days after creation of wound are shown. After treatment with gentamicin (8 mg kg-1) and AgNPs (0.02, 0.04, 0.08 mg kg-1), the wound bed areas decreased significantly (p < 0.0001) from day 7 to day 21. There was significant difference (p < 0.0001) between AgNPs (0.08 mg kg-1) group with other groups and gentamicin with control group at day 7. No significant differences observed between control group and AgNPs (0.02 mg kg-1) and gentamicin (8 mg kg-1) group with AgNPs (0.08 mg kg-1) in day 14 (Table 1). Table. 1. Effect of topical application of gentamicin (8 mg kg-1), AgNPs (0.08 mg kg-1), AgNPs (0.04 mg kg-1) and AgNPs (0.02 mg kg-1) on wound area (mm2). Data are presented as mean ± SEM. The percentage of wound was contraction compared with day 0 is provided within the parentheses. * Asterisks denote p-value signiﬁcance comparing AgNPs 0.08 mg kg-1 to the other groups (p < 0.0001). Topical application of gentamicin, AgNPs (0.08 mg kg-1) and AgNPs (0.04 mg kg-1) increased the rate of wound healing significantly more than AgNPs (0.02 mg kg-1) and normal saline group. Wound healing in the genatmicin, AgNPs (0.08 mg kg-1) and AgNPs (0.04 mg kg-1) groups were nearly complete in day 21 after wound induction, whilst the wound in mice of AgNPs (0.02 mg kg-1) and control groups had not been healed entirely (Table 1). No side effects were observed on body weight, general health and behavior of animals during treatment. Increased wound closure was observed in groups treating with AgNPs and gentamicin at days 7 and 14, respectively. Almost all wounds in animals except control and AgNPs (0.02 mg kg-1) groups’ ones reached 100% closure at day 21. Data analysis showed that good inhibition of bacterial growth (S. aureus) was gained in all groups treated with AgNPs or gentamicin. Staphylococcus aureus count in control group was significantly higher than treated mice and was more than 300 colonies on medium (defined as uncountable) in first two weeks and some wounds appeared infected, obviously (Fig. 1). A significant reduction in wound bacterial count was obtained in treated groups. The AgNPs (0.04 mg kg-1 and 0.02 mg kg-1) groups had a slight but significant reduction in bacterial count compared to control group, reaching to 1 CFU g-1 (total count) and 0 CFU g-1 (S. aureus count) in day 21. The highest inhibition of bacterial growth was obtained in groups receiving AgNPs (0.08 mg kg-1) and gentamicin (Table 2). Table 2. Bacterial count of wound bed in treated and untreated mice. Nanomaterials with antimicrobial activity that elevate the effectiveness and safety of antimicrobial administration are called nano-antibiotics. 19 Their capability in control of infection has been explored and demonstrated in vitro and in vivo.20 Due to prompt prevalence of multidrug-resistant pathogens and insufficient research regarding antibiotic production; the AgNPs could be useful alternatives of routine antibiotic therapy. Silver is a broad-spectrum antimicrobial that inhibits growth of microbes.22 It has been previously shown that AgNPs have in vitro antibacterial activities against S. aureus.23 In this study, we report in vivo capabilities of AgNPs that appear to accelerate healing of wounds inoculated with S. aureus in a mouse model of skin wound. This study showed that AgNPs dilutions accelerate wound healing and this acceleration is more noticeable in 0.08 mg kg-1 level. Reportedly, AgNPs are responsible for reducing the time required for hyperactive cells (myofibroblasts) involved in generation of contractile force in the wound and reverse the inflammatory processes more quickly compared to antibiotic application.24,25 Topical application of AgNPs effectively enhanced the remodeling of wounds area and diameter and skin macroscopic appearance in mice. In this study, it was observed that 14 and 21 days after treatment, in groups treated with gentamicin or different dilutions of AgNPs, total and S. aureus bacterial loads reduced significantly. Gentamicin and AgNPs (0.08 mg kg-1) were more effective than AgNPs (0.04 mg kg-1) and AgNPs (0.02 mg kg-1) in reducing bacterial loads, so total and S. aureus amounts were 0 CFU g-1 in day 21 after wound induction. In control group, 7 and 14 days after wound induction, the amounts of total bacteria and 7 days after wound induction, the amounts of S. aureus increased, so they were uncountable in plate. This difference in total and S. aureus amounts may be due to antibacterial activities of AgNPs against gram-negative and gram-positive bacteria. There is no clinical study about the effects of AgNPs on bacterial load, however, the in vitro antibacterial effects of AgNPs are well documented. Our findings support the potent antibacterial activities of AgNPs as antibacterial agents in infected wounds and suggest their use in preparing medical devices such as indwelling vascular catheters. These devices can prevent the proliferation and colonization of opportunistic bacteria in patients. The results of this study introduced a remarkable in vivo nanosilver accelerating effects on the treatment of on S. aureus infected skin wounds with no obvious side effects in mice. Rizzi SC, Upton Z, Bott K, et al. Recent advances in dermal wound healing: Biomedical device approaches. Exp Rev Med Dev 2010; 7(1): 143-154. Burke JP. Infection control - a problem for patient safety. New Eng J Med2003; 348(7): 651-656. Bratzler DW, Houck PM. Antimicrobial prophylaxis for surgery: An advisory statement from the national surgical infection prevention project. Clin Infect Dis 2004; 38(12): 1706-1715. Liesbet DB, Coessens G, Boelens J, et al. Microbial etiology and antimicrobial resistance in healthcare-associated versus community-acquired and hospital-acquired bloodstream infection in a tertiary care hospital. Diagnostic Microb Infec Dise 2013; 77: 341-345. Tian J, Wong KK, Ho CM, et al. Topical delivery of silver nanoparticles promotes wound healing. Chem Med Chem 2007; 2: 129-136. Lansdown AB. Silver in health care: antimicrobial effects and safety in use. Curr Prob Derm 2006; 33: 17-34. Lkhagvajava N, Yashab I, Chelik E, et al. Antimicrobial activity of colloidal silver nanoparticles prepared by sol-gel method. Dig J Nanomater Biostruct 2011; 6(1): 149-154. Beveridge TJ, Phadtare MN, Lee H, et al. Adv Microb Physiol 1997; 38: 177-243. Huh AJ, Kwon YJ. Nanoantibiotics: A new paradigm for treating infectious disease using nanomaterials in the antibiotics resistant era. J Control Release 2011; 15(6): 128-145. Ziv-Polat O, Topaz M, Brosh T, et al. Enhancement of incisional wound healing by thrombin conjugated iron oxide nanoparticles. Biomat 2010; 31: 741-747. Baumans V, Van Loo PLP. How to improve housing conditions of laboratory animals: The possibilities of environmental refinement. Vet J 2013; 195: 24-32. Tanideh N, Rokhsari P, Mehrabani D, et al. The healing effect of licorice on Pseudomonas aeruginosa infected burn wounds in experimental rat model. World J Plast Surg 2014; 3(2): 99-106. Tymen SD, Rojas IG, Zhou X, et al. Restraint stress alters neutrophil and macrophage phenotypes during wound healing. Brain Behav Immun 2013; 28: 207-217. Michael LC, Xianfeng CHH, Mark AF, et al. Elastic modulus and viscoelastic properties of full thickness skin characterised at micro scales. Biomaterials 2013; 34: 2087-2097. Yates CC, Whaley D, Babu R, et al. The effect of multifunctional polymer-based gels on wound healing in full thickness bacteria-contaminated mouse skin wound models. Biomaterials 2007; 28: 3977-3986. Williams RL, Sroussi HY, Abercrombie JJ, et al. Synthetic decapeptide reduces bacterial load and accelerates healing in the wounds of restraint-stressed mice. Brain Behav Immun 2012; 26(4): 588-596. Weir E, Lawlor A, Whelan A, et al. The use of nanoparticles in anti-microbial materials and their characterization. The Analyst 2008; 133(7): 835-845. Jiang B, Larson JC, Drapala PW, et al. Investigation of lysine acrylate containing poly(N-isopropylacrylamide) hydrogels as wound dressings in normal and infected wounds. J Bio Mat Res 2012; 100: 668-676. Etheridge ML, Campbell SA, Erdman AG, et al. The big picture on nanomedicine: The state of investigational and approved nanomedicine products. Nanomed 2013; 9: 1-14. Pal S, Tak YK, Song JM. Does the antibacterial activity of silver nanoparticles depend on the shape of the nano-particle? A study of the Gram-negative bacterium Escherichiacoli. Appl Enviro Microb 2007; 73: 1712-1720. Mohammadi R, Rabbanib SH, Bahramic H, et al. Antibacterial performance and in vivo diabetic wound healing of curcumin loaded gum tragacanth/poly(ε-caprolactone) electrospun nanofibers. Mat Sci Eng 2016; 69: 1183-1191. Anand KKH, Mandal BK. Activity study of biogenic spherical silver nanoparticles towards microbes and oxidants. Spectrochim Acta A Mol Biomol Spectrosc 2015; 135: 639-645. Kazemi J, Ahmadi M, Dastmalchi Saei H, et al. Antibacterial effect of silver nanoparticles along with protein synthesis-inhibiting antibiotics on Staphylo-coccus aureus isolated from cattle mastitis. Bio J Micro 2014; 2(8): 15-22. Karim RZ, Adnan R, Ansari MS. Low concentration of silver nanoparticles not only enhances the activity of horseradish peroxidase but alter the structure also. PLoS ONE 2012; 7(7): 14-22. Lu PY, Lee CM. Silver nanoparticles mediate differential responses in keratinocytes and fibroblasts during skin wound healing. Chem Med Chem 2010; 5(3): 468-475. Kvitek L, Panacek A, Prucek R. Antibacterial activity and toxicity of silver-nano silver versus ionic silver. J Phys Conf Ser 2011; 304(1): 120-129.